Fig. 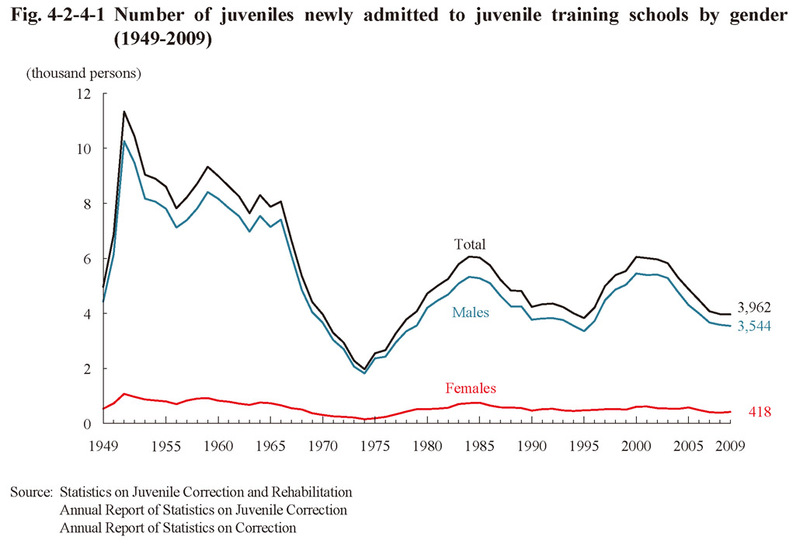 4-2-4-1 shows the number of juveniles newly admitted to juvenile training schools by gender since 1949. 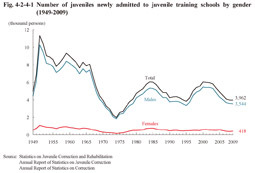 The number of juveniles newly admitted to juvenile training schools has fluctuated after reaching a post WWII low in 1974 at 1969. During the last 10 years the number reached a peak of 6,052 in 2000, but since then has continued to decrease (See Appendix 4-12). Fig. 4-2-4-2 shows the number of juveniles newly admitted to juvenile training schools and rate per population by age group since 1975. Examining the number of juveniles newly admitted to juvenile training schools over the last 10 years revealed that the number of junior juveniles reached a peak in 2000 at 999 and then continued to decrease but increased by 36 from the previous year in 2009 to 744. The numbers of intermediate juveniles and senior juveniles both reached peaks in 2001 at 2,583 and 2,560, respectively, and then continued to decrease but the number of senior juveniles then increased by 61 from the previous year in 2009 to 1,598. 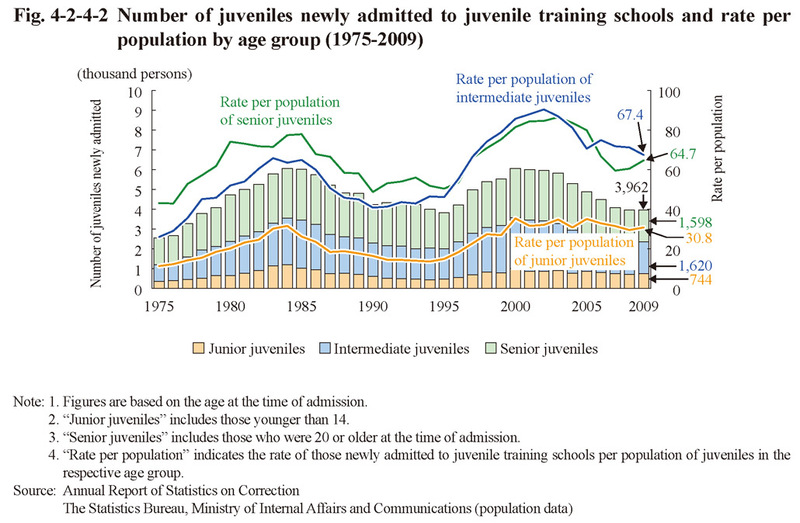 Comparing the rate per population of the respective age groups in 2009 (the number of juveniles newly admitted to juvenile training schools being 3,962) with that in 1979 (4,074 (id.)) and then that in 1994 (4,000 (id. )), when the number of juvenile inmates was basically at the same level as 2009 after 1974, revealed that the rate per population was higher for all ages in 2009 (that in 1979, 1994, and 2009 of junior juveniles being 18.5, 13.6, 30.8, intermediate juveniles 45.8, 46.5, 67.4, and senior juveniles 61.8, 51.8, 64.7, respectively). Two male juveniles and one female juvenile younger than 14 were newly admitted to juvenile training schools in 2009. Fig. 4-2-4-3 shows the percent distribution of juveniles newly admitted to juvenile training schools by type of delinquency, gender, and age group in 2009. Unlike females the proportions for both Stimulants Control Act violations (1.4%) and pre-delinquency (2.3%) were remarkably low for males. In addition, as the age of the group rose, the proportion for injury/assault declined with males, whereas those for pre-delinquency and injury/assault declined but for Stimulants Control Act violations significantly rose with females (See Appendix 4-13). Fig. 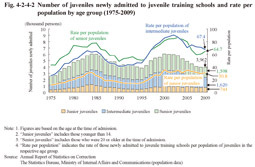 4-2-4-4 shows the percent distribution of juveniles newly admitted to juvenile training schools in 2009 by educational level and gender, while Fig. 4-2-4-5 shows the same by educational/employment status and gender. By educational level the proportion of junior high school graduates and senior high school dropouts was high with both males and females. By educational/employment status the proportion of unemployed and students/pupils was higher with females than males. Fig. 4-2-4-6 shows the percent distribution of juveniles newly admitted to juvenile training schools by association with delinquent groups and gender in 2009. With both males and females being associated with delinquent groups the proportion of those associated with local delinquent groups was the highest. The proportion of those associated with hot rodders was lower but with Boryokudan higher with females than males. Fig. 4-2-4-7 shows the percent distribution of juveniles newly admitted to juvenile training schools by guardian status and gender in 2009. The proportion of those whose guardians were their biological mothers has been on a rising trend over recent years, whereas the proportion of those whose guardians included both their biological fathers and mothers has declined by 17.0 points when comparing the 1999 and 2009 figures (Source: Annual Report of Statistics on Correction).